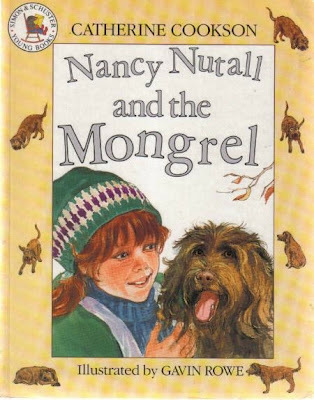 Bookride: Nancy Nutall and the Mongrel. Catherine Cookson, 1982. Nancy Nutall and the Mongrel. Catherine Cookson, 1982. Further to my piece yesterday I thought I would do a children's story dog book by the reasonably saleable but prolific Catherine Cookson. By the way - Other slow selling books and writers unmentioned yesterday include Anthony Adverse by Hervey Allen, Antony by his Son the Earl of Lytton, Philip Gibbs, Richard Gordon, Doris Leslie, Walter H. Page, Marguerite Steen, Thornton Wilder and Van Loon. As for Anna O. Buchan's 'Unforgettable, Unforgotten' - forget it. Catherine Cookson. NANCY NUTALL AND THE MONGREL. Macdonald, London, 1982. Illustrated by Carolyn Dinan, more admired and collected in USA than UK. Glossy illustrated boards, could show up in a jacket but possibly never had one. Anyway, a real find if you see one at a jumble, boot or library sale. Dame Catherine wrote over 100 books but this is possibly one of the most valuable, it was her last book for children. VALUE? On net 2006/2007 people were asking between $180 and $500 for the US 1990 Simon and Schuster paperback and one reasonable UK ed was listed at £300, another a little compromised in condition at £200. They have been around now for many months and I suspect this book is not saleable at such stroppy prices, especially with a magazine appearing for Catherine Cookson members that contains this story and seems to sell for less than $20 on ebay. The UK is the one you want and $500 for the paperback is barmy. Our pic shows the US ed.